If you are keeping an eye on the market for Tallahassee high end homes, you'll be happy to know that there is no sign of weakening for the most expensive homes in town. Though there still exists a glut of high end homes for sale in the Tallahassee MLS, sales have actually grown fractionally over the same period from last year. In fact, 2013 has seen more Tallahassee high end homes sold than any year since 2008. If you read our recent blog post titled A Comprehensive Review Of Tallahassee Real Estate Supply And Demand then you know there is more than 35 months supply of homes priced over $750,000. The real estate graph below shows Tallahassee high end homes sold every year from January through April, and 2013 reports in at #5 in a twelve year span. The stacked bar graph records the total number of homes sold each year, broken down by price range. Most of the "high end homes" that are selling are priced from $400,000 to $600,000 (blue bars), and most markets would not even call these luxury home prices. But in Tallahassee, you get a lot of home and location on that budget. The reason that we track from $400,000 and higher for our report on Tallahassee high end homes is because this range typically reflects the top 5% of the housing market. In the graph above, we see that homes priced above $400,000 only represented 1% of the market in 2002, when the market was not yet into the expansion cycle that lead to the housing bubble. But as the market went crazy, Tallahassee built and developed a lot of high end homes. At the peak, more than 8% of the market was buying these luxury homes, and we now have to step back and ask ourselves some important questions. Since 2002, the number of Tallahassee high end homes being built and sold skyrocketed. You have to ask yourself where this new demand came from, and can we bring it back? Certainly we expect "normal" demand to return to Tallahassee, but homes priced over $400,000 were far from normal, they were only 1% of the market. No major change in the population occurred since 2002, and no major positive change occurred in the economy (employment base) during this time. So where were all these luxury home buyers coming from? I believe they came from new loan products that proved to be a cancer on the housing market. Low interest only adjustable mortgages allowed mid-level buyers to purchase "twice as much home" for the same monthly payment they were comfortable making. But these loan products had a suspense date, and many of these loans went into default when that date arrived. Ultimately, the Tallahassee high end homes market was not built upon increased real demand, but rather on artificial demand created by the ability to borrow money easy and cheap. The "easy" loans are gone, but the cheap ones remain. You can still buy high end homes with very low interest rates, but the loans are fully amortized (meaning borrowers begin paying down the balance right away). What will happen to our luxury home market in Tallahassee when "cheap" goes away? Supply and demand will drive the market for all homes in Tallahassee, luxury homes are not immune to this natural relationship. Currently, supply grossly outweighs demand for Tallahassee high end homes, thus we are looking to the demand side to determine what can be (or will be) done to return the Tallahassee real estate market to balance. For people looking to sell a luxury home in Tallahassee, this is of the utmost importance. Unfortunately, I see some serious issues for the long term outlook for the top 5% of our market. 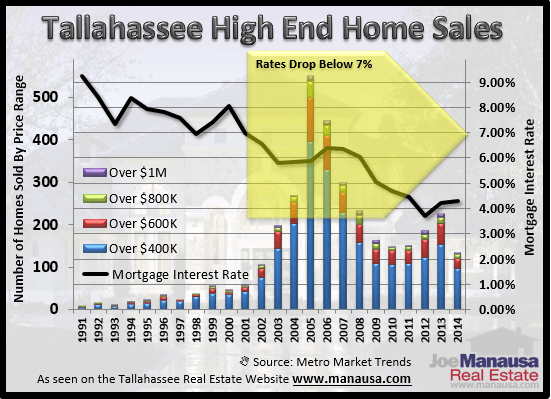 The only reason high end home sales in Tallahassee are still robust is because historically low mortgage interest rates make it fairly easy to purchase (more than 70% of our luxury home buyers finance the purchase of the home). When interest rates begin to rise in the coming years, moving back to the historical norm of 8.4%, the number of people who can afford these homes in Tallahassee is going to be reduced greatly. This means that if you are trying to sell a luxury home in Tallahassee, you better sell it now or prepare to slash your price greatly. We warned all price ranges of falling values from 2007 through 2012 and advised "sell it fast, sell it now" in order to get top dollar. 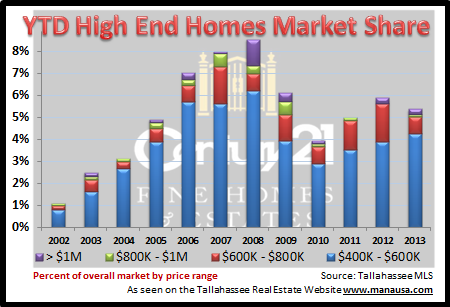 Some of the lower price ranges are now recovering, but Tallahassee high end homes are not. If you own a luxury home in Tallahassee, you must heed this advice. The longer you wait, the likelier you are to see a declining pool of prospective homebuyers. If you own a property in the Tallahassee high end homes market and are thinking about selling, just drop me a note and we can schedule a time for a comprehensive review of your personal situation and give you the best advice possible.